Peach sorbet is one of the best peach dessert recipes to make with fresh peaches! The best part is that this sorbet recipe only has THREE ingredients! Summer desserts don’t get easier than this. The farmer’s markets around here are filled with peaches, pears, and apples. Of course, I can my mama bear sliced peaches every year so we get a bunch of peaches. There’s always a few I leave out to throw in some recipes. We had a couple of hot days and I wanted to play more with my ice cream maker. What a perfect time for some peach sorbet! Wesley isn’t much of a fruit eater. I begged him to try the sorbet and he said it tasted like mango. The one and only fruit he will eat. I think that he related the color of the sorbet to mango, because it tastes like a fresh peach. I really love the color of the sorbet though. It reminds me a fresh and bright flavor. Do you relate colors to flavors? I think it’s only natural right? 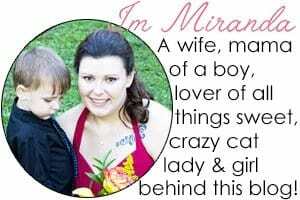 I almost forgot to this horrifying story. As I was slicing up these darling peaches, I couldn’t resist the urge to pop a slice in my mouth. I started chewing it down and taking notice of how sweet and juicy it was and I hear a loud crunch. Now, let me just tell you before hand, my front teeth aren’t rotting out of my head or anything. I had trauma to a front tooth and it ended up infecting the tooth next to it and I had to have surgery and root canals done on them. So back to the story, I immediately start feeling around my back teeth because I figured I crunched down on piece of a pit. All was intact, which immediately made me run my finger across my front teeth. I feel a sharp jagged edge. I have an immediate panic attack and run to the bathroom. Yep, the tooth next to my front tooth was partially missing. Ladies and gentlemen, this was one of my biggest fears. I tried calling the hubs ..oh about 100 times to only end up getting his voicemail. I call my mom at work and started sobbing. I looked absolutely ridiculous and I have a wedding I’m in near the end of September. I ended up getting into a dentist a week later to only find out that I don’t have enough tooth to save. Being that September 27th I’m a brides maid in my best friend’s wedding, they built me a tooth to hold up for the wedding. I guess after I find a buyer for my soul to pay for an implant since I don’t have dental insurance, I’ll have a spanking new fake tooth. Moral of this story, peach sorbet won’t break a tooth and sliced peaches will. Truth! Of course, a couple of scoops of fresh peach sorbet will help my mouth feel better. Come enjoy some fresh peach sorbet with me! I love how light and fruity this peach sorbet is! 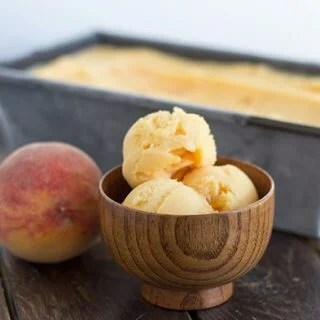 Get yourself some ripe peaches and get to work on this sorbet recipe! Want more peach recipes? Try these! Peach sorbet is one of the best peach dessert recipes to make with fresh peaches! The best part is that this sorbet recipe only has THREE ingredients! Summer desserts don't get easier than this. In a large saucepan, place all three ingredients. Turn on the heat to medium and cook until the peaches are very soft. It took mine about 15 - 20 minutes. Remove from the heat and let cool for 30 minutes. Place in a food processor or blender and puree until smooth. Place in a bowl and chill over night. Place in the ice cream maker the next morning for the recommended time for your ice cream maker. Mine recommends no longer than 20 minutes. Place in a freezer safe container and freeze for 2 hours or until very firm. Scoop and serve!